A legal fight over water rights is heating up in the Imperial Valley, pitting farmers against their own irrigation district in a struggle for control of the biggest water entitlement along the Colorado River. A judge’s ruling has forced the Imperial Irrigation District to repeal its plan for apportioning water, which had set limits on how much water individual growers could use on their fields. The case has also touched off heated arguments at meetings — and sharply worded letters between lawyers — about landowners’ water rights and the role the district should play as a “trustee” in divvying up and delivering water. While some farmers suggest the two sides should settle the dispute, others argue the differences are too substantial to reach an agreement and will need to be decided by a California appeals court. The case has elicited arguments stretching back over a century of western water law, from the 1922 Colorado River Compact to a 1980 U.S. Supreme Court decision, Bryant v. Yellen, in which the justices said Imperial Valley landowners “have a legally enforceable right, appurtenant to their lands, to continued service” by the irrigation district. The Imperial Valley enjoys some of the oldest rights to Colorado River water, which began flowing to the area via canal in 1901 and turned this swath of the Sonoran Desert into a lush, green agricultural powerhouse. Farming drives the local economy, contributing an estimated $4.5 billion annually in economic output and spending by ag companies and employees. The valley produces crops including alfalfa, wheat, lettuce, broccoli, onions, carrots, sugar beets, cauliflower, cabbage, Brussels sprouts and cantaloupes, among others. 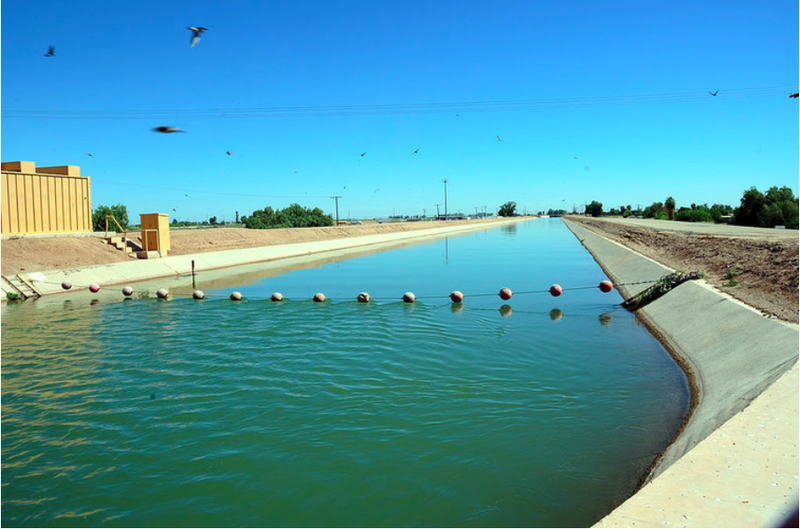 The irrigation district supplies about 530 agricultural customers, delivering water through a network of canals and pipes that fan out across the valley like the lines on a circuit board. The amount of water the district delivers is subject to an overall annual cap. When there are overruns, as happened in 2011 and 2012, the district is required to pay back the difference by taking less during subsequent years. Responding to the two consecutive years of overruns, the IID board adopted its so-called Equitable Distribution Plan in 2013 in an attempt to stay within the annual limit. The district’s officials used what they called a “hybrid” method, basing the per-acre water limits partly on each farmer’s historical water use and partly on a standard amount applied to all growers.